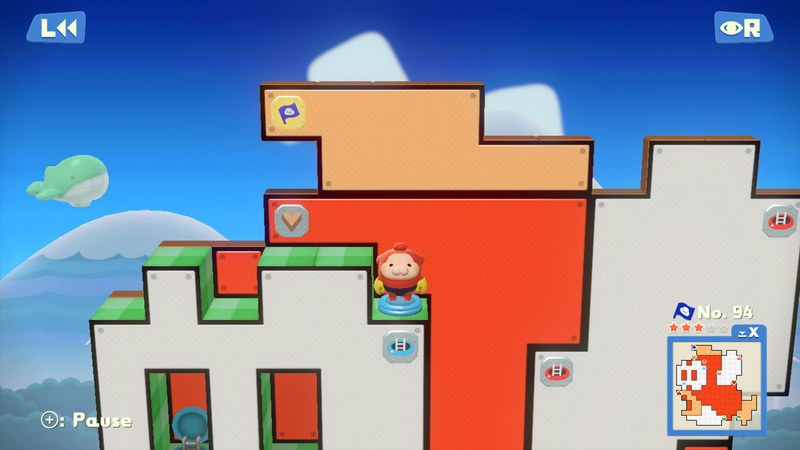 Earlier today we brought you details of Pullblox World coming to the Wii U eShop in Europe, and Nintendo of America has now stepped in to confirm its own release details. As with previous releases its branding will be slightly different, and it'll be called Pushmo World in the region. It'll arrive in North America on 19th June and will also have a price promotion to encourage players to pick up the 3DS predecessors. From 28th May to 13th June Pushmo will be reduced to $4.69 and Crashmo to $5.99. Unfortunately there's no equivalent offer to get the Wii U title for less if you own the 3DS games, so it'll cost a flat $9.99 when it launches. The Miiverse-driven Pushmo World Fair is described as the "main hub of Pushmo World and serves as an interface to the Pushmo World Miiverse community", and as explained in our original article linked above it will allow created stages to be shared with QR codes, with the European game page also confirming cross platform stage sharing when applicable. Scott Moffitt, Nintendo of America’s executive vice president of Sales & Marketing and rather popular for his numerous Nintendo Direct appearances, says the following in the press release. Pushmo and Crashmo are two of the most well-received games ever released exclusively in the Nintendo eShop on Nintendo 3DS. Pushmo World makes it easy for players to create and share their own puzzles, and it’s a joy to experience Mallo’s colorful world in HD for the first time. So there you have it, we'll all be enjoying this new entry on the same day. Are you planning to pick it up? Hey NOA I take it back. You are not far behind this time. Really, NOA? NoE had the perfect idea with the cross-buy discount, don't let the steam die so quickly! Why don't they do the same cross platform discount?! What a wasted opportunity. Although now that the first two games are on sale, i'll probably still pick at least one of them up. I knew Nintendo wasn't going to give the wiiU discount to owners of previous games in the series. NoA always finds a way to screw it up somehow. Pushmo and Crashmo were well-received, so it makes sense to assume that a fair number of people bought at least one of them already, if not both, so this move feels unjustified. Well, it's unfortunate that they haven't announced the cross-buy discount, but I can't complain. I was thinking about buying Crashmo last week, so it's a good thing I held off! I mean, with UK's deal, it feels like NoE is encouraging people who have Pull/Fall Blox to buy Pullblox World. With this it seems like NoA just wants to squeeze a few more sales out of the older games, rather than prioritize selling the new game to everyone, including those who have played its predecessors and those who haven't. I will definitely be downloading this on my new Wii U! I haven't finished Pushmo, I may get Crashmo for WiiU tho. I don't think this title is released one week after E3 by accident. It seems like this title might be the launch of a more unified account feature between 3DS and the Wii U, and that NoA might announce a cross-system discount at E3 while they discuss unified accounts? I own Pushmo and Crashmo, there's just no way I'm paying $10 for this when other regions are getting a discount. NoA strikes again. Ugh. @jariw Well now I'm somewhat hyped up. Dang it man! At least the days will fly by when MK8/Windwaker arrive on my Wii U. It would be amazing if NoA did that, but I think that everyone would hide the info of cross-buy if it were the case. But if it happens then Reggie will reign supreme. Think it's about time I finished those extra Pushmo and Crashmo puzzles. Excited to play Pushmo World!! Pretty cool and unexpected. I might pick up Pushmo and Crashmo. I will get Pushmo World though for sure. E3 is here for a reason Nintendo. Nintendo announces a new Wii U game. An awesome one at that, AND they put the 2 previous games on 3DS on sale. YET SOMEHOW, people see this as a bad thing and YET AGAIN, complain. Wow. If I didn't have the first two already I'd be cooler with this. Not that it matters, I'll get it anyway. From out of nowhere, it's a $10 game that looks really nice and polished with cool Miiverse integration and stage sharing...they offer you a discount of previous titles on your 3DS to get you hyped and what's the reaction? "Nintendo would find a way to screw it up!" Really? People dump that kind of money to remove timers from F2P mobile game turds, and yet they whine when a brand new complete game with cool features is $10? @Marioman64 - They put a video trailer up on the North American e-shop, it looks really smooth and polished in HD. Looks like a ton of content and features for $10...I hesitated to make the jump on 3DS, but I think I'm gonna love having this on my Wii U pad thanks to all the hype and nice looking previews.